It's a tricky thing, choosing an online handle. You've gotta stick with it forever, so the dumb inside joke or ironically stupid insult you choose will be your name forevermore. As a general rule, Blizzard gives users a one-time-only chance to change their mind on their "BattleTag." But, given that a good number of people who played the beta of Diablo III may have used that chance already, they've extended the privilige to all their users a second time. 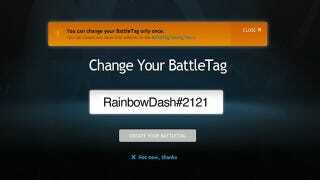 So, if you're still not happy with your battletag, you can hop on into your account settings page and change it again. Man, I wonder how many people have tried to change their Battletag to "Error" in the hopes of landing Error#3737.